The son of nine-year NFL veteran Don Beebe, the 24-year-old created a buzz in training camp with his crisp route-running skills, and continued to impress in the preseason with his work late in preseason games. 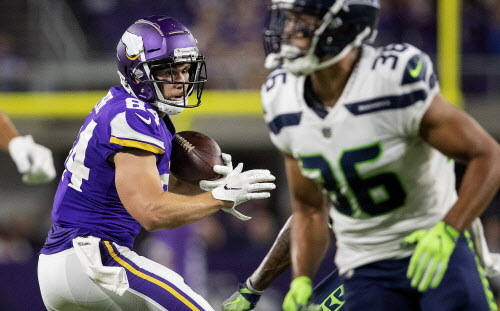 With Stefon Diggs’ status in question for Sunday’s game against the Lions because of a rib injury that kept him out of practice all week, the Vikings activated Chad Beebe from their practice squad on Saturday. The son of nine-year NFL veteran Don Beebe, the 24-year-old created a buzz in training camp with his crisp route-running skills, and continued to impress in the preseason with his work late in preseason games. He caught nine passes for 95 yards in the preseason, grabbing a pair of fourth-quarter touchdown passes from Kyle Sloter in the Vikings’ wins over the Broncos and Seahawks. His work on the practice squad has attracted rave reviews, and he could have a strong opportunity against the Lions on Sunday. Diggs, who sustained a rib injury in the second quarter of the Vikings’ game against the Saints on Sunday night, was listed as questionable for the game and said on Thursday he expected to play on Sunday against the Lions, but did not practice at all this week. The only Vikings player in Mike Zimmer’s tenure to play in a game without practicing all week was tight end Kyle Rudolph, who was active against the Bengals last December after being listed as doubtful for the game. To make room for Beebe, the Vikings released tackle Storm Norton, who could wind up back on the practice squad now that Riley Reiff is set to return from his foot injury.